Umbrella strollers are great for busy sidewalks, navigating public transit places and excellent for traveling with a baby. There are lot of factors to consider like weight , the canopy size, recline-ability of the seat to name a few. 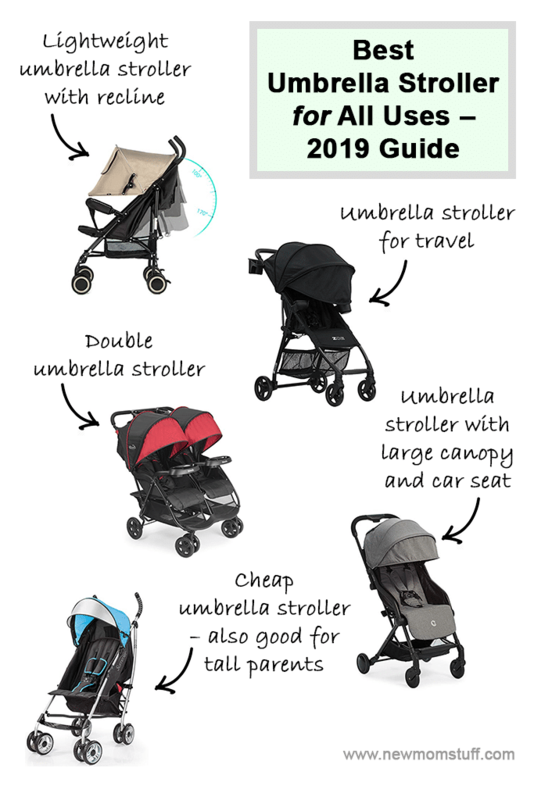 With hundreds of models in the market choosing the best umbrella stroller can be a daunting task, Here at NewMomStuff, we have researched over twenty umbrella strollers and learnt from experience of 30+ moms before narrowing down to the strollers below. 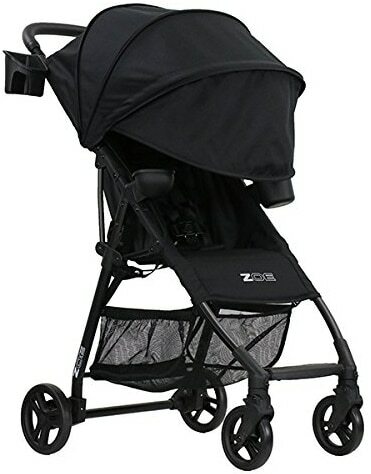 If it’s a lightweight, easy to bring along for a walk in the park kind of baby stroller you need then, the EVEZO 2141A Umbrella Stroller is created just for you. Tag your baby along for a brisk walk around the block with this everyday-use stroller. Ultra lightweight yet framed with premium grade steel, it’s handy and durable– and just perfect for your tight budget. 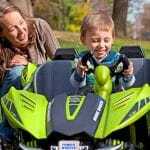 It features adjustable belt for recliner, full size canopy, 5-point safety harness and front collision safety bar as well as double safety lock and wheel lock. When not in use, simply detach the safety lock and step-down on the lock back. You can pick your choice of color here. This stroller comes in blue, gray, and pink. Front wheel sticks a little while turning making it difficult to manoeuvre at times. Time for a quick getaway? Visiting grandma for the weekend? Traveling with kids can be quite challenging with all that luggage in tow. Luckily, the ZOE XL1 BEST v2 Lightweight Travel & Everyday Umbrella Stroller System offers just the relief you need. Super lightweight, fuss-free folding system and easy to maneuver, this stroller is designed to be a lifesaver when the road gets tough. Frame is as stable as it gets and can even hold a diaper bag being saddled on the handle bar. Seat can be hold up to 50lbs and can be reclined for a child’s comfort. Durable padded harness are also included for safety and security. Canopy comes with a mesh peekaboo window and can be rolled up when Sun is out. 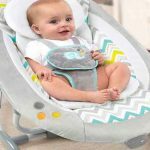 Additional features include a side pocket to hold keys, cellphone or snacks; a parent cup holder, a kid cup holder and snack cup, and a belly bar. Pick your choice of color here. This stroller comes in black, aqua, and plum. May not fit through the security check scanner so may need extra time to be able to get it through security using manual checks. Got twins or a couple of kids to tow along for a stroll? Then, the Kolcraft Cloud Plus Lightweight Double Stroller is perfect for you. Lightweight at just 23lbs amid the double-person accommodation, this stroller is built for the big leagues and for busy families out there. A trip to the park or a walk round the block is made more comfortable and safe with these awesome features: reclining seats, extendable canopies, front wheel suspension and easy-folding mechanism when in parking mode. For added enjoyment, it also comes equipped with child and parent trays and 2 storage baskets. Trays can also be detached and cleaned. Check out more details here. Comes with a Parent tray to with two deep cup holders and storage area. Want something compact yet huge in features, the Contours Bitsy Compact Fold Stroller is it! 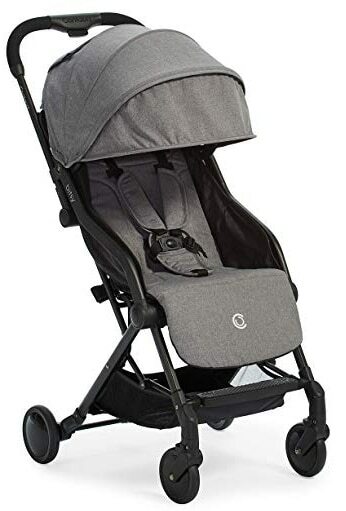 Jetsetters, daytrippers, vacationers and prolific strollers will enjoy this super lightweight and airline-friendly stroller. Stylish and practical, it’s also compatible with more than thirty car seat brands sans the usual adapter. 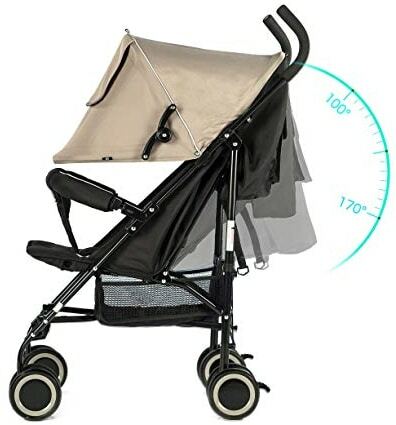 Easy to fold and reclining can be done at 140 degrees, the stroller can also accommodate up to 40lbs of weight including stored items right off its back saddlebag. Pick your choice of color here. 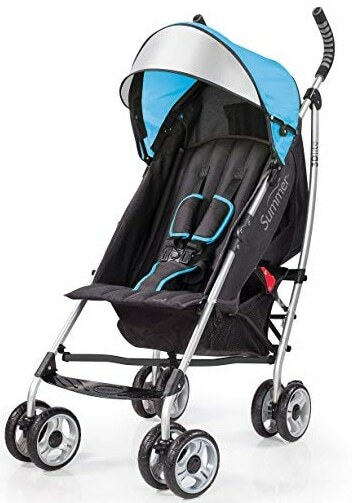 This stroller comes in bermuda teal or granite gray. Folding the stroller is super easy and can be done with one hand! Ever tried maneuvering a stroller that’s too short for your frame that you need to slouch? Then, you’ll probably know what a killer lower back pain can get. Not with the Summer Infant 3Dlite Convenience Stroller though. Perfect for households with tight budget but with tall frames to contend with, this stroller is a convenient yet safe solution to tow along kids when out and about. Safety is guaranteed with its 5-point harness. Maneuvering the stroller is also quite effortless and convenient with its one-hand fold system and carry strap. Stopping by to talk to friends, simply press the rear lever down to lock its brake and adjust the canopy to not let baby catch the sun’s harmful UV rays. 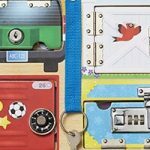 Storage for diaper bags, purses and personal stuffs also come handy when out enjoying the outdoors with your child. Pick your choice of color here. This stroller comes in 6 awesome motifs: black, Caribbean blue, gray, red, teal, or tropical green. 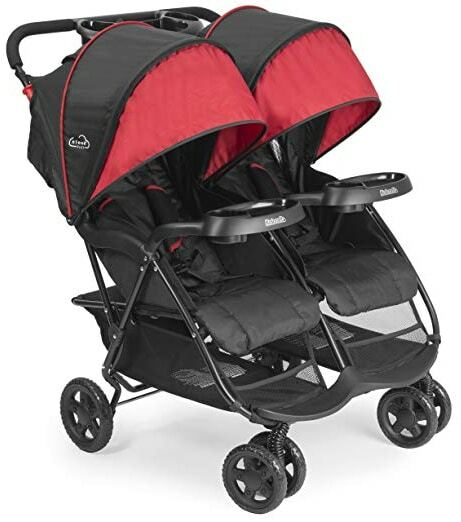 Fully reclines and very comfortable for a lightweight and compact stroller. Back wheel suspension is not that great and can make the ride a little bumpy. Difficult to maneuver with one hand. When can I start using an umbrella stroller? If the stroller reclines fully it is even safe for newborns. But for umbrella strollers that does not recline fully it’s best to wait till the baby is at least 3 to 4 months old. Can I bring umbrella stroller on plane? As you know now there are good choices for umbrella stroller for every usage or budget. It is our goal to provide you the details you need to make the best decision for your family. Hope we have been able to do so!